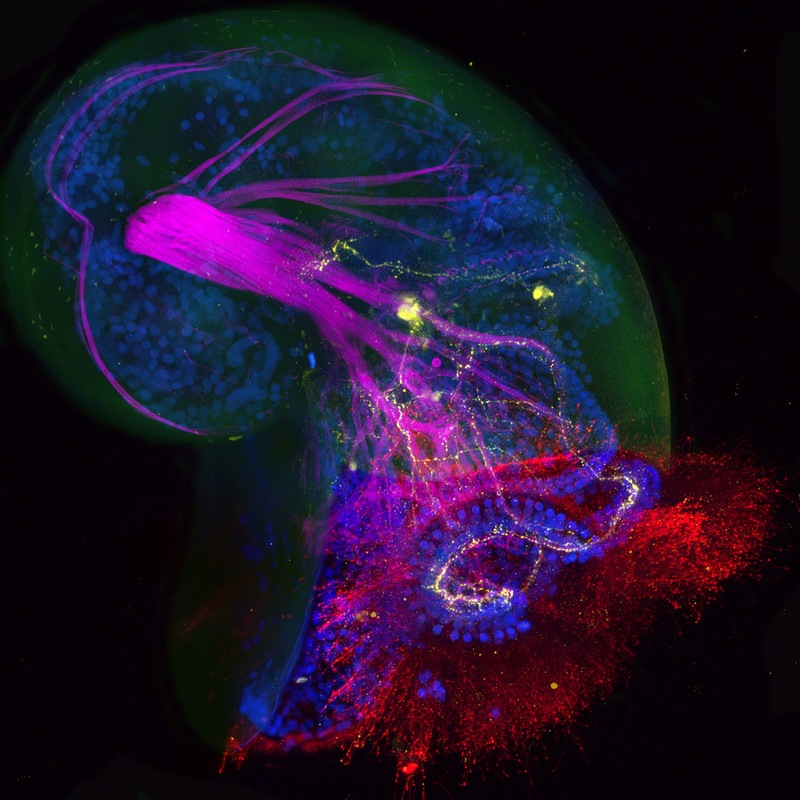 Back in February, you voted on the first set of beautiful images taken by last year’s Woods Hole Embryology Course students, and this confocal picture of a mouse embryo appeared on the cover of Development last month. Now it’s time for the next round: please vote in the poll below for which of the following four images you would like to see on a future cover of the journal. To see bigger versions, just click on the image. 1. 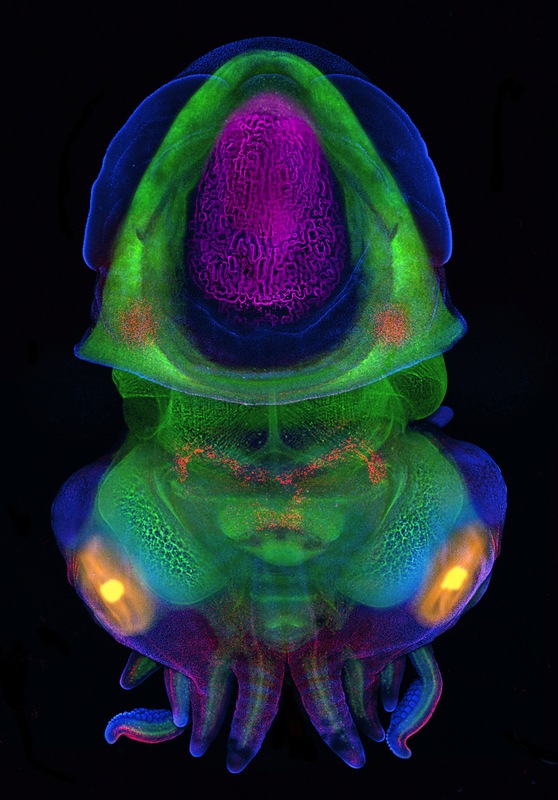 Confocal image (extended focus Z stack) of a Crepidula fornicata (slipper limpet) veliger larva. Stained with phalloidin (F-actin; purple), DAPI (cell nuclei, blue), anti-serotonin (yellow), and anti-acetylated tubulin (red). 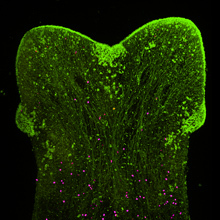 The shell (green) image was created from the DIC picture collected during the confocal scan. The C-shaped line of nuclei are cells at the edge of the velum; the acetylated tubulin (red) staining reveals the ciliated surface of the velum. The F-actin staining (purple) highlights the main larval retractor muscle. Serotonin (yellow) reveals the serotonergic neuron cell bodies and axons. This image was taken by Joyce Pieretti (University of Chicago), Manuela Truebano (Plymouth University), Saori Tani (Kobe University) and Daniela Di Bella (Fundacion Instituto Leloir). 2. 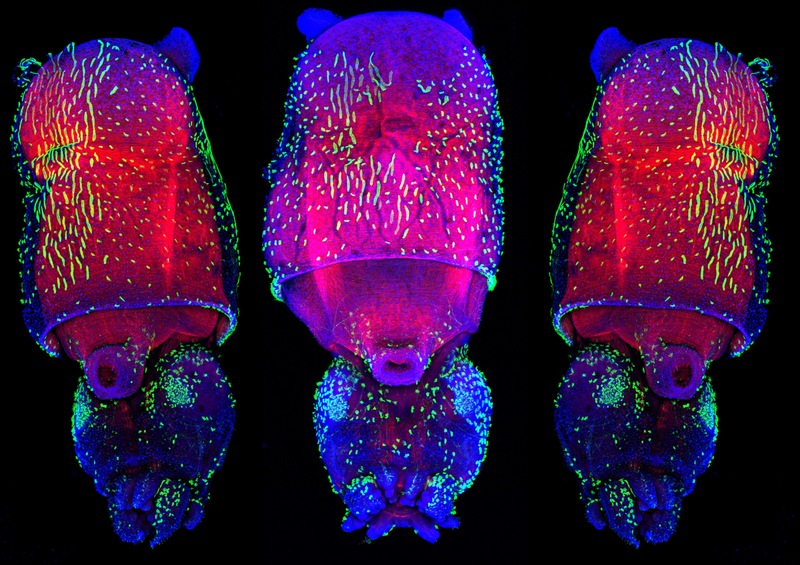 Embryo of the dwarf cuttlefish, Sepia bandensis, stained with phalloidin (F-actin; green), DAPI (nuclei, blue), and anti Pax 3/7 (MAb DP312, red). The developing cuttlebone (purple) and eyes (yellow) were rendered using the DIC image collected during the confocal scan. The F-actin staining (green) reveals the developing musculature and brain, while Pax 3/7 (red) is expressed in a subset of neurons in the brain as well as two patches of epithelia in the mantle and portions of the arms and tentacles. The cuttlebone (purple) is a chambered, gas-filled internal shell made of aragonite that provides buoyancy control. Within each eye (yellow), the developing lens is seen as an internal sphere. Seven of the eight arms are visible along with the two tentacles that have sucker-covered ends. This image was taken by Maggie Rigney (University of Texas, Austin) and Nipam Patel (University of California). 3. The planarian, Dugesia sanchezi, immunostained for acetylated tubulin (green) and phospho-histone-H3 (dividing cells, purple). This individual has regenerated two heads. 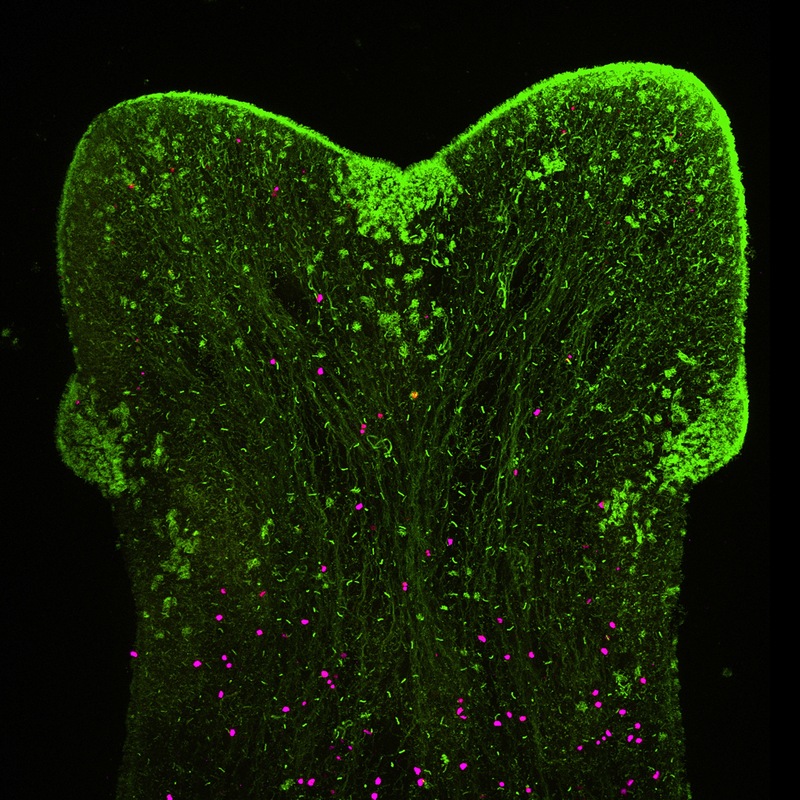 This image was taken by Chang Liu (Shanghai Institute of Biochemistry and Cell Biology). 4. 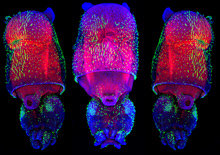 Juvenile of the Longfin inshore squid, Loligo pealei, stained with anti-acetylated tubulin (green), phalloidin (F-actin, red), and Hoechst (nuclei, blue). The F-actin staining (red) reveals the musculature of the mantle; and the acetylated-tubulin staining (green) reveals the tufts of cilia on the surface of the mantle and rest of the body. This image was taken by Wang Chi Lau (Chinese University of Hong Kong). Which of these images would you like to see on the cover of Development?